Eight Kid Reporters from the award-winning Scholastic News Kids Press Corps sat down with First Lady Michelle Obama for an exclusive interview in the Map Room of the White House. During the interview, Kid Reporters Gabriel Ferris, 15, of Winslow, ME; Manu Onteeru, 14, Sterling, VA; Adedayo Perkovich, 12, New York, NY; Courtney Pine, 11, Washington, DC; Stone Shen, 12, Acton, MA; Maxwell Surprenant, 13, Needham, MA; Erik Weibel, 14, Benton, PA; and Skylar Yarter, 13, Maplewood, NJ, asked the First Lady about her “Let’s Move!” initiative, plans for the future, and much more. 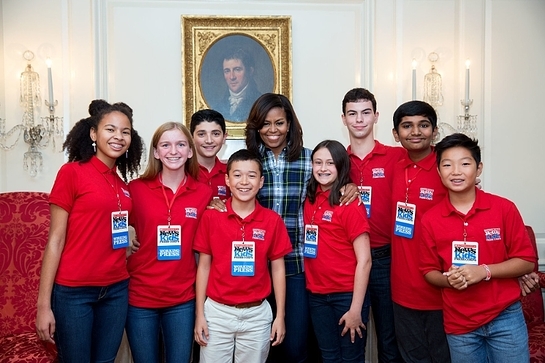 Original Kid Reporter stories from the Scholastic News Kids Press Corps interview with First Lady Michelle Obama are available online. 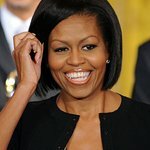 The interview with First Lady Michelle Obama is also featured in upcoming print issues of Scholastic classroom magazines, including Scholastic News, which are read by more than 25 million students nationwide. The Scholastic News Kids Press Corps is a group of 35 young reporters, ages 10–14, from across the country. For more than 16 years, Kid Reporters in the Scholastic News Kids Press Corps have covered “news for kids, by kids,” reporting on current events, breaking news, and entertainment stories from reporters’ hometowns and around the world. Stories by Kid Reporters appear on the Scholastic News website and in select issues of classroom magazines.